Starting today, 1/15. at Walgreens, Huggies diapers, Pull-ups and/or Goodnites are on sale for $11.99 each or 2 for $18 ($9 each). If you spend $30, you'll receive $10 register rewards. Plus, we have printable coupons and rebate deals thru 1/19 that will yield these deep savings. Lastly, we also have an in-ad coupon that will give you 5x everyday points...load it to your Balance Rewards card so that you don't forget at checkout. 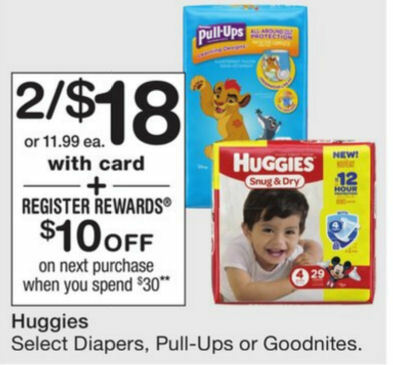 If you don't need the combo above of diapers, pull-ups and goodnites...then below are 2 scenarios for you.